Yesterday afternoon I decided to spend some time going through my collection of vintage pattern books. It was supposed to be an effort to find books that I could sell or give away. Instead, it turned into an afternoon of admiring the many patterns that I have. I came across this book by Columbia Minerva that does not have a copyright date listed but appears to be from the late 1950’s or early 1960’s. This book is part of a collection that I received from an extended family member. The book starts with 8 pages of how to information on knitting and crocheting along with instructions for taking measurements and finishing a new garment. Then there are 70 pages of patterns. The infant section includes cardigans, caps, booties, soakers, a baby bunting and several baby blankets. 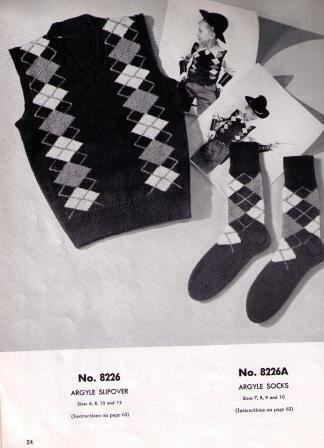 There’s also a junior section for children, a women section that includes a Ladies slip over and cardigan set, a great pair of gloves, and a Paneled shirtwaist dress, and the family group has several afghans, a mother and daughter cardigan set, and a men’s argyle slipover vest and socks. Finally, there is a stitch dictionary section that has about 15 patterns. But the pattern that caught my attention and demanded to be started is this Doll Coat and Bonnet. This coat is sized for an 18 inch doll. The gauge is 6 stitches to an inch on size 4 needles. I just happen to have several skeins of Patons Astra in a dark green that will work nicely. There is also a matching coat and Bonnet for a “Little Miss” in sizes 3 and 4. This doll coat and bonnet will be an excellent addition to my collection of doll outfits made from vintage patterns. I cast on the stitches for the coat before the afternoon was over. I did find many other wonderful pattern books. Although, I only found a few that I’m willing to part with, I found many items that I want to knit. So my To-Do List gets longer. The most interesting find of the afternoon is a hand written pattern for a blanket. The title on the page is “Treasure Chest”. I’m going to begin to type the pattern today and make it this winter. 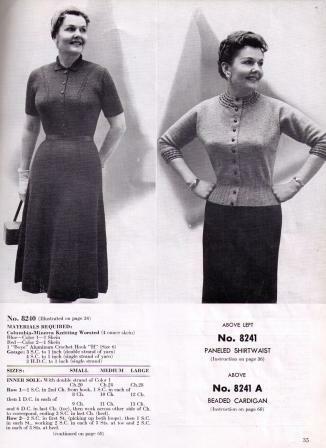 I love the idea of passing on patterns from the past to future knitters and crocheters.